Odds are that every Pompano Beach homeowner is going to need a plumber for drain cleaning at some point in time. Every homeowner has dealt with slow drains and typically those are dealt with using an unclogging commercial solution like Liquid Plumber or the more toxic Draino. But when those chemicals don’t work, resist the urge to cram a modified hanger down the drain or buy a manual snake; you can do more damage than good. When you have a drain cleaning problem that isn’t easily solved, you need to call a professional plumbing service. Trying to clear a clog with a hanger or a manual plumber’s snake is likely to damage the drain and rarely will clear the blockage. Many drain cleaning jobs are easy to resolve when you have the knowledge and the right equipment (like say a professional plumber has). But there is one clog that can get very involved. If you have a clogged first floor toilet, and it’s accompanied by a slow or backed up tub drain, you may have a clogged sewer line. If all your toilets are backed up you most definitely have a blocked sewer line. The sewer line is the largest pipe in your plumbing system and it runs from the city sewer line in the street to your home. It is, obviously, underground. When the plumber determines that may be the problem, he will use a truck mounted snake on the drain vent outside your home to attempt to clear it. If that doesn’t work he can send a camera into the line to inspect it. From there it may be a question of using a root cutter, or digging up the line and replacing the damaged part. If you are in this boat you want an experienced plumber you can trust. 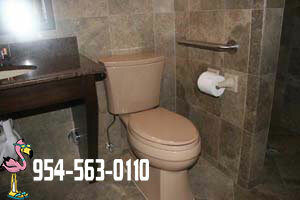 Our customers have nothing but good words for us and we would encourage you to give us a call for a free estimate.